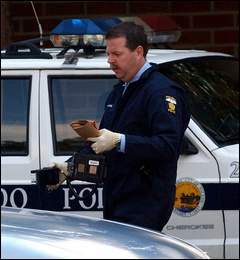 A Toledo Special Investigations Unit officer removes a wrapped gun from the scene of the Violet Drive shooting. As she was being led to the Lucas County jail, Yvonne Jenkins told reporters she shot her boyfriend inside her West Toledo apartment yesterday because he was abusive and was beating her. The 27-year-old was being held on a felonious assault charge while her boyfriend, Omar Parker, 23, lay in a Toledo Hospital bed with two gunshot wounds to his chest, one to his knee, and possibly one to his elbow. Police said he was taken to surgery after arriving at the hospital. His condition was unknown last night. A hospital spokesman said she had no information on a patient by his name. Ms. Jenkins’ relatives, many of whom live at the Violet Road apartment complex where the shooting occurred, said the couple has a history of fighting and domestic abuse. Mr. Parker, of 1750 Milburn Ave., called Ms. Jenkins and told her he was coming to her residence at Brookside Village Apartments, 4696 Violet. She let him into her second-floor residence, unit 211, and they started arguing, investigators said. After Mr. Parker hit Ms. Jenkins, who was lying in bed, she reached under her pillow, pulled out a 9mm handgun, and shot Mr. Jenkins in the chest about 10:20 a.m., detectives said. Police said Ms. Jenkins went to another apartment where her sister and mother reside and asked a friend, Linda Tilman, to get her purse — which contained medication for anxiety attacks and depression — from the closet door in her bedroom. Ms. Tilman saw a wounded Mr. Parker on the bed, grabbed the purse, and ran. When she got outside, the police had arrived. Police recovered the gun in a trash bin in front of the complex. Ms. Jenkins, who was escorted by an officer at police headquarters downtown, told reporters she got the weapon from a friend. Ms. Jenkins is scheduled to be arraigned today. Ms. Tilman, who recently learned that Ms. Jenkins is a distant relative, said the mother of two girls isn’t a troublemaker, but that Mr. Parker pushed Ms. Jenkins too far. Ms. Jenkins’ relatives said they hope Ms. Jenkins and Mr. Parker will be all right. They said Ms. Jenkins is a good person, and they find it hard to believe she shot someone. “I [have] never known her to hurt anybody like that,” said her mother, Katherine Norris. Court records indicate Ms. Jenkins has two pending misdemeanor cases, one for criminal damaging, the other for aggravated menacing; the latter case has a temporary protection order listing Andra Parker, 53, who lives at the Milburn address, as the alleged victim. It was unclear if she was related to the man who was shot. According to the aggravated menacing complaint signed by Ms. Parker, Ms. Jenkins came to her home July 29, 2003, brandished a switchblade, and threatened to kill her. Ms. Jenkins and Mr. Parker have misdemeanor and traffic convictions, according to court records. Contact Christina Hall at chall@theblade.com or 419-724-6007.